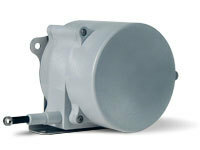 SR1A is a rugged, low-cost, high performance string pot built for wet environments and outdoor applications. Originally designed for off-road construction equipment, the SR1A is the perfect low-cost solution for OEM and stocking distributors. Available in 62-inch, 125-inch and 175-inch stroke ranges, the SR1A is constructed of a rugged polycarbonate enclosure designed to withstand impact from harsh environments and rugged conditions. Each sensor ships with a handy mounting bracket to make just about any installation very simple. Every SR1A ships with a field installable mating connector and optional cord sets are available.